To most of us floral arrangements are nothing more than a haphazard bouquet jammed into a vase on the mantelpiece or the sort of fancy basket you buy for colleagues leaving the company. If you don’t know a gardenia from a gooseberry, it’s vital to find somebody who can turn your unadorned venues into a riot of gorgeous flowers. Here’s how to track down the perfect florist. Florists aren’t mind readers, so it’s a good idea to do some research into what kinds of arrangements are available before you start setting up meetings. Look through bridal magazines, browse the Internet and ask to borrow friends’ wedding albums.If you’ve got no idea what will look good in your chosen setting, then ask florists whether they’ve done weddings in your venue before. They’ll be able to advise you better and may well have photos of previous ceremonies and receptions that’ll help you get a handle on the possibilities. Three things will be of paramount importance in deciding on your floral arrangements; the colour scheme of your wedding, what kind of flowers you want to use and the containers you want to put them in. Bear in mind that popular flowers such as roses, orchids and lilies tend to be more expensive than less well-known blooms, so if you’ve got your heart set on these, be prepared to adjust your budget. Season will also have an impact on what’s available, so don’t plead for bluebells in October – there just won’t be any! There’s certainly no rule that says flowers have to be arranged in starchy bouquets sitting in prim vases. They can be turned into long Christmas-style swags, laid on mirrors, scattered over flat surfaces, or floated in bowls on tables. 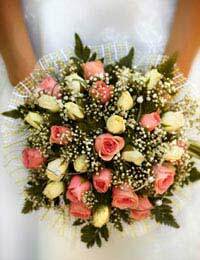 Florists may also be able to provide candelabras and candles to complement your arrangements. Start making appointments at least three months before the wedding. Good florists tend to get booked up quickly and you’ll want a head start on the competition, especially over the busy summer period. Your primary consideration when looking for a florist shouldn’t be budget – you need someone who understands what you’re looking for and makes you feel confident about your choices. It’s important to find out whether the person you’re talking to will be doing the work on the day. Set a budget for your flowers and be prepared to stick to it. If the florist starts suggesting blooms out of your price range, then they’re doing you a disservice, no matter how attractive their plans may be. If you’re booking a wedding package through a venue, they may try to get you to use a florist they work with regularly. Don’t be railroaded - explain you’d be happy to meet their recommended people, but that you’re shopping around for the right person.Florists can agree to set up more than one wedding in a day, particularly at busy times of the year. Talk to your chosen outfit to find out whether this is the case and ensure their schedules are realistically compatible with your own. Check with your florist beforehand whether they’ll be delivering the flowers to the venues, as well as if they can bring the bouquets and buttonholes to your base. You’ll have to delegate someone to pick them up if not. Summer brides may find their bouquet wilts a bit as the day goes on. See if the florist can provide a vase for you to stand the flowers in before the service and at the reception so the blooms stay fresh as long as possible. If you want to go with tradition, but can’t bear to throw your gorgeous (and expensive) bouquet to your female guests, ask for a separate, cheaper posy to be prepared so you can hurl it at the appropriate time.